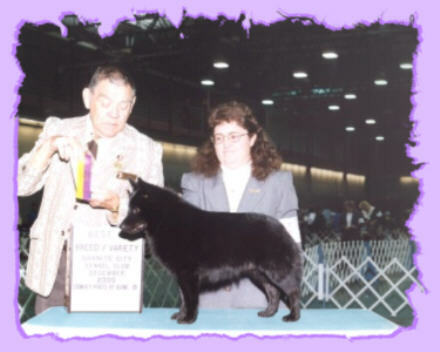 Granite City Kennel Club Dec. 9, 2000. Judge Mr Forrest W Mccoy. 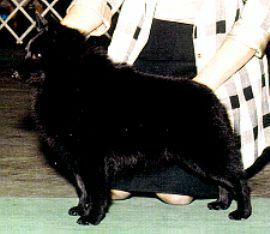 at Cudahy Kennel Club. Judge Mr. Steven M. Jeffery. 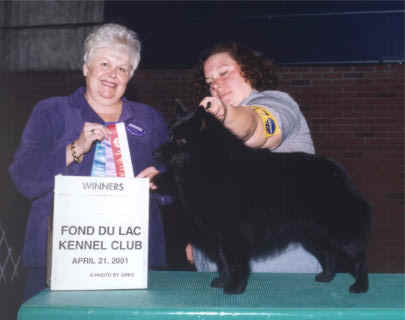 Fond du Lac K.C. show April 21, 2001. Shown by my good friend Lisa Ott. Judge: Ms. Gail H. Forsythe. Click on the picture below to see a larger view of the picture. 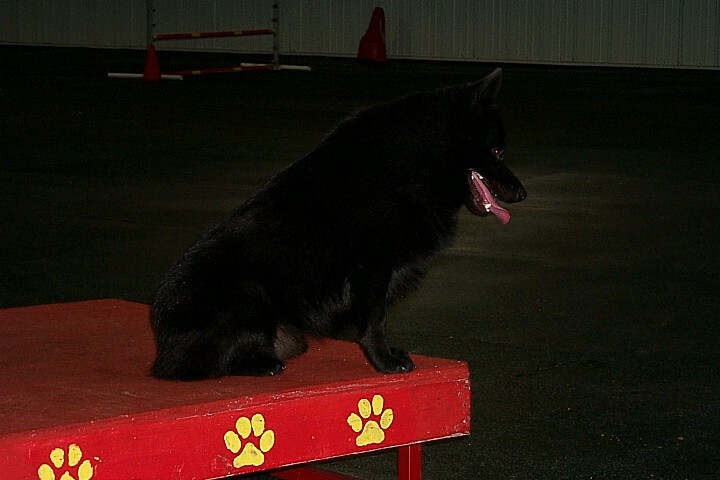 Hunter got certified today (April 30th, 2006) for tracking by Doug Weil an AKC tracking judge. yeahhh!!! I was nervous on the way there and was hyperventilating LOL. It was raining and windy out. Hunter started out good and we did the 1st 3 legs of the track (which the judge said, the 1st 3 legs were the most difficult parts of track) no problem and then on the 4th leg he got off track and couldn't find his way back to it for awhile. He almost shut down on me and quit. He was getting frustrated because he couldn't find the track. I thought we where done and failed. But luckily he got back to the track and we got the fourth leg of the track. He had a hard time finding the next turn, but then when he found it we got the 5th last long leg with no problems and found the judges article at the end of the track. 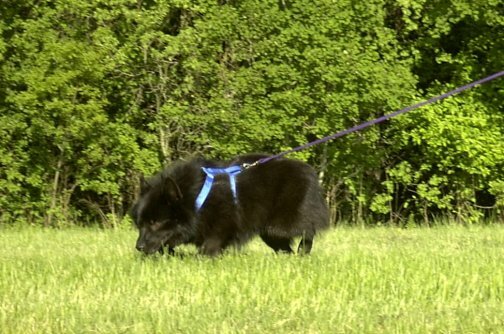 Now we can enter an AKC Tracking trial and try to get Hunters Tracking dog title (TD). 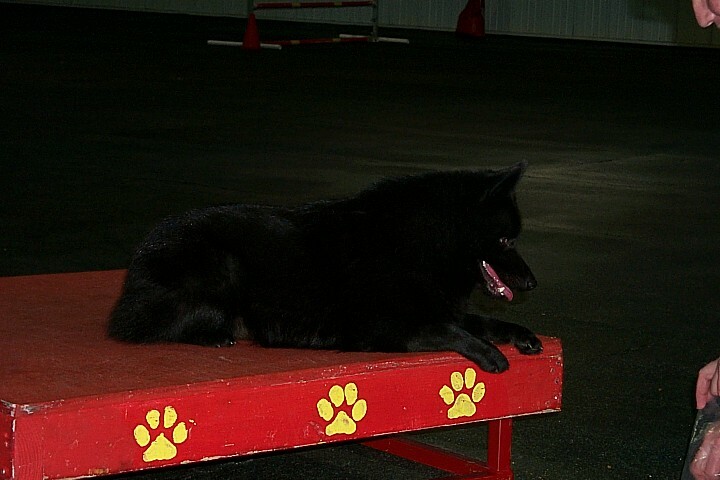 Hunter got his tracking dog title today May 14th, 2006 at the Marshfield Area Kennel Clubs 1st tracking trial. He did his track in only 6 minutes. I was so very proud of him. Hunter did really well. Later Judge Craig Green said Hunter was a working machine. 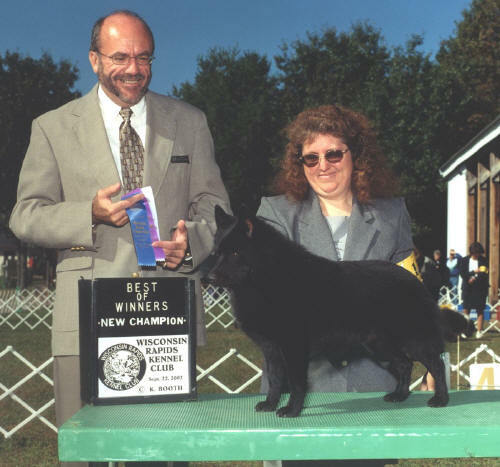 Click here to see Hunter's map of his track from Judge Ed Presnall from New Munster, WI. Click here to see Hunter's track that he did with Judge J. Craig Green from Highlands Ranch, CO.
Hunter got his 1st Jumpers With Weaves leg. Hunter got his 2nd Jumpers With Weaves leg. He got a score of 95 and a 3rd place. 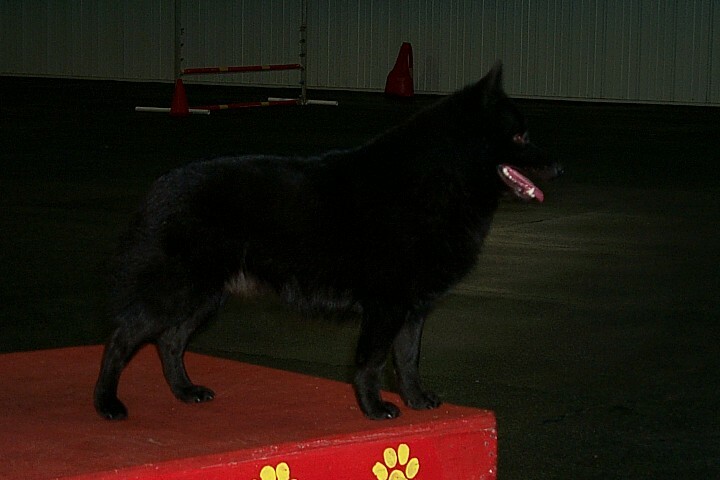 Ch.Raffinee Ready T' Rumble "Michael"
He has excellent side movement. He is also pictured below.